Caption slip reads: "Photographer: Snow. Date: 1954-01-10. Reporter: Cowles. Assignment: Terry Moore returns. 27/28: Terry Moore taking last look at her famous ermine bathing suit. 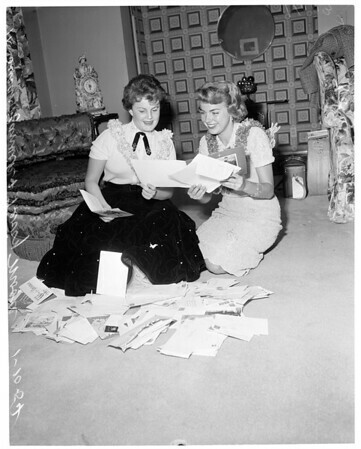 81: Terry Moore and Susan Zanuck read X-mas cards. 82: Reverse of 81".